Omg! This could be the prettiest Yee Sang that I ever tossed and tasted. Recently we the classic award-winning Shanghainese Cuisine @ Shanghai Restaurant, JW Marriot Kuala Lumpur. The Chinese New Year Menu is crafted by Executive Chinese Chef Wong Wing Yuek, from Shanghai. Chef Wong is a man who is dedicated to serving only the best and most authentic dishes from his native city. This year the Yee Sang at Shanghai restaurant is interesting and accompanied by delicacies such as lobster, geoduck, abalone, jellyfish, salmon or fresh fruits for a refreshing twist on a traditional dish. Vegetarians will not miss out on this iconic dish as they can enjoy Yee Sang made with vegetarian ham. The Yee Sang is served with a luscious homemade sauce which is Shanghai’s well-kept secret recipe. 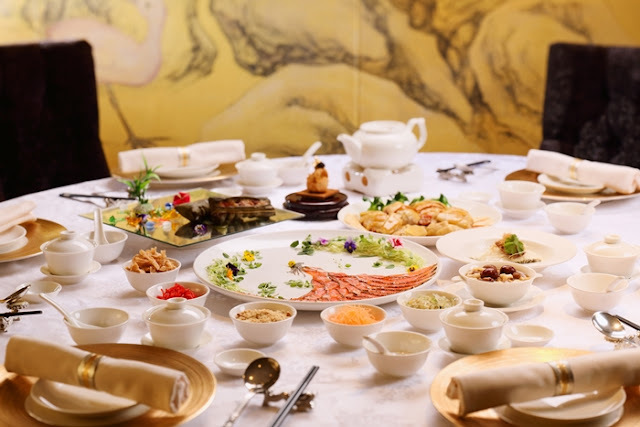 In creating an auspicious feast for family and friends to usher in good luck, prosperity, good health and joy, Shanghai has specially created three set menus this year. Starting from RM288.80 per person, these menus are perfect for reunions and corporate gatherings. Luxuriate your palates in specialities such as Braised Superior Fish Maw Soup with Sea Cucumber, Bird’s Nest, Mushrooms and Shredded Chicken, Steamed Cod stuffed with Chinese Ham served with Honey and Supreme Stock Paste, Stir-fried Succulent Prawns with Sweet and Sour and Mustard Pastes, Traditional Rice with Chinese Waxed Meat and Vegetable in Casserole, Steamed Bamboo Fish Shanghainese-style with preserved vegetable, Chinese Ham and Mushrooms, Braised Spanish Pork with Pine Nuts and Vegetable, and Sweetened Cordyceps Flower with Snow Fungus. Available on the Chef’s Specialities à la carte menu are unique and delectable creations to be savoured - Steamed Chicken with Chinese Herbs, Wolfberries and Red Dates, Shanghainese Family Hot Pot with Assorted Dried Seafood, Braised Abalone with Superior Fish Maw, Dried Scallop and Mushroom in Casserole, Steamed Glutinous Rice with Abalone and Spanish Pork Wrapped in Bamboo Leaves, Deep fried Bean Curd stuffed with French Goose Liver and Truffle Paste and Deep-fried Crispy Glutinous Rice Cake with Yam. Shanghai’s selection of Yee Sang is now available for your enjoyment. The specially curated Lunar New Year set and à la carte menus are available for lunch and dinner from 5 January until 19 February 2019.